A Sennebogen 655 heavy duty cycle crawler crane has been put to put to work on the River Rhine in Germany to help carry out lock maintenance repairs. 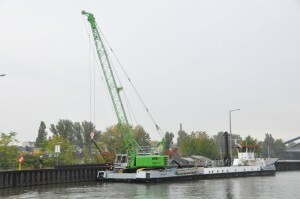 The crawler is carrying out the work on the Offenbach lock chambers for the Aschaffenburg Water and Shipping Authority (WSA). The Offenbach lock chambers are part of the Main federal waterway, which runs 185.2 km from the mouth of the River Rhine. In total, 15 locks require regular maintenance. The Sennebogen 655 heavy duty cycle crawler crane is used by the WSA to help carry out regular inspections and repairs of the locks. The crawler carries out the work, which includes lifting steel plates, from the multi-purpose ferry Muräne. The steel plates are used to hold back the water, so the inspection lock gates can be installed. The plates weigh up to 4 tonnes each and measure between 6 and 9 m long. The 655 HD was specially designed for use on the ferry, a company spokesperson said. It is driven by a 261 kW diesel engine and has two hoisting winches and a reinforced double-row slewing ring. Plastic pads are fitted on the crawler tracks to protect the ship’s deck, a spokesperson added. The crane has also been fitted with extras, including an inclination scale to indicate the angle of the ship and the boom. Biologically degradable hydraulic oil is used in case of leakage into the water, a spokesperson added.